Born in Oregon, Jack graduated from Oregon State University (1952-57), earning a B.S. degree. He was sports editor for the Corvallis Gazette-Times from 1957-73. He then became associate sports editor at the Tucson Citizen (1973-76) and then sports editor (1976-81). At the Citizen he was the University of Arizona basketball beat writer (1982-88), football beat writer (1997-98), softball beat writer (1999-2004) and was the golf editor from 1973-2004. Because of his dedication to golf, he started the Citizen Senior Cup Golf Tournament in 1976, the Gibson Cup (an annual match between Southern Arizona pros and amateurs) in 1986 and was responsible for creating the Tucson Citizen All-Sports Award for high school all-around sports excellence. During his writing tenure, he covered 31 Tucson Open golf tournaments, 25 LPGA tournaments and a number of Phoenix Opens. In 1972 he was recognized by the Oregon Press Association for “Best Sports Section” in the state of Oregon, and in 1995 was runner-up for Journalistic Excellence by the Golf Course Superintendents of America. PCSHF member Coach Lute Olson says: “Jack is a class act. He has been a very positive member of the media in Tucson.” PCSHF member Armen Dirtadian says: “Jack’s longevity as a sports journalist in this community speaks for itself. Jack has been a wonderful asset in this city with his timely reporting and human interest stories. He is not only a reporter, but he cares very much about Tucson and its people. And he has a passion for sports. 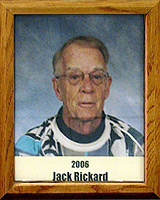 In 2007 Jack was inducted into the Arizona Golf Association Hall of Fame, the first journalist to be so honored in 30 years.